Visual Basic for Applications (VBA) is the programming language we use when writing macros in Excel (and other Office programs). 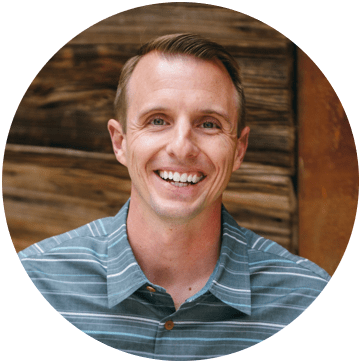 It allows us to program Excel so we can save time with boring repetitive tasks, and focus on the fun stuff. We can use VBA for everything from automating a simple task to developing robust applications and add-ins. Seeing VBA code for the first time might make your head spin. It's not too difficult to read, but understanding what the code means and how it works will make VBA a lot easier to use. VBA is all about programming objects. We basically write code that manipulates the objects in Excel. Objects are just about every thing you can think of in Excel like worksheets, ranges, charts, pivot tables, etc. I was thinking about this while chopping potatoes for a soup my wife was making. How would I program all the steps I was taking to wash, peel, and cut the potatoes? I was working with quite a few different objects like the sink, cutting board, peeler, and knife. To prepare the potatoes I had to perform actions with the objects like peeling with the peeler, chopping with the knife, etc. I also had to check the properties of the objects: the sharpness of the knife, firmness of the potatoes, and size of the cutting board. All of this information could easily be translated into code to reference the properties and actions of the objects I was working with. And this is exactly what we do in VBA. Now, my wife needed them cut a certain way for the soup. She wanted 1/2 inch cubes. So we might need to specify parameters for the cut. Something like the following. The “Cut” is an action that is performed on the potato, which is part of the Food collection. These actions are referred to as Methods in VBA. What if I wanted to determine if the knife was sharp and clean. Those would be properties of the knife and might look something like the following. Well the same is true with VBA and the Excel Object Model. Just like our cooking example, we can write VBA code to automate tasks in Excel. This code can read/write properties of the objects, or run actions (methods) on the objects. 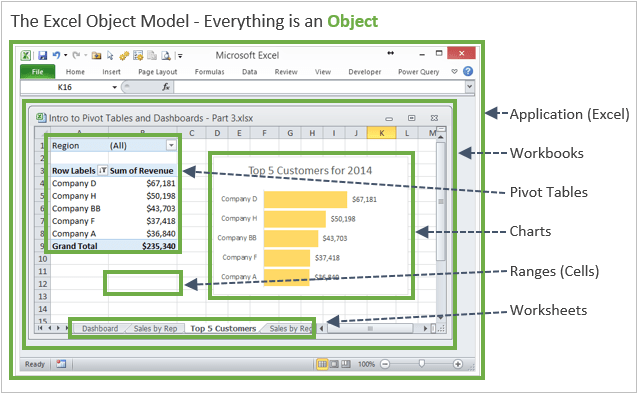 The Excel Object Model is the library of all the objects in Excel. As you can imagine, it's a huge library! Each object has its own properties and methods that we can use to make decisions and take actions with our code. There are three basic things we can do with properties and methods. Worksheets.Count – returns the number of worksheets in the active workbook. Range("A1").Value – returns the value in cell A1 of the active workbook and active sheet. Worksheets(1).Name = "Summary" – changes the name of the first worksheet in the active workbook to Summary. Range("A1").Value = 100 – changes the value in cell A1 to 100. Methods are actions that can be performed with the object. These are usually actions you would take in Excel by pressing a menu button or keyboard shortcut. Here are a few examples. ActiveWorkbook.Close – Closes the active workbook. Most properties and methods contain additional parameters that you can specify to customize your request. Looking back at the example of cutting the potato, my wife wanted 1/2 inch cubes so I specified that when using the Cut method. When we use the Worksheets.Add method in Excel to add a worksheet, the Add method has optional arguments or parameters that can be specified to tell VBA: where to place the new sheet, how many sheets to insert, and what type of sheet. You can also press Ctrl+I to bring up this info box with the parameters. The Excel Object Model is a massive library. I have been coding VBA for 10 years and still don't know everything. I probably never will. But it's easy to get help and learn about the objects you want to use. Put the text cursor inside any property or method and press F1 on the keyboard to view the help page for that item. This is a great way to see what all the parameters are and learn more about VBA. By the way, the keyboard shortcut to open the VB Editor is Alt+F11. Press Alt+F11 (Function+Option+F11 on Mac 2011) from anywhere in Excel to open the VB Editor and view the code modules. Next Do You Use VBA? Thank you for your clear explanation, I have learned a lot from your website. Sincerely thanks to you! WOW! This potato example is one of the best i Have seen. Kudos! The potato cutting analogy is interesting. I’ve never seen such ‘real world’ processes to explain VBA. Nicely done. Great post. I never knew that F1 trick. Unknown unknowns. Thanks Jeff! It’s one reason to keep the F1 key around. I know a lot of Excel users want to get rid of it because of the importance of it’s big brother, F2. But F1 does come in handy in VBA.